If you like garden railroads – or even if you don’t – you will definitely enjoy the Holiday Train Show located in the Enid A. Haupt Conservatory at the NY Botanical Garden in the Bronx. 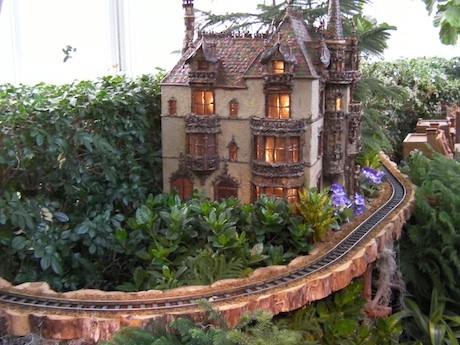 This is an outstanding display of garden model railroading, botany and architectural modeling at its finest. The many G scale trains, including passenger, freight and trolley, run flawlessly over many bridges and waterways, through multiple tunnels, weaving in and out of “forests” of horticultural heaven. Even more impressive than this, which would have been enough, the structures and scenes populating the garden are more amazing than you can imagine. Many of the structures are landmarks, like Yankee Stadium, St. Patrick's Cathedral and Pennsylvania Station on Eighth Avenue among many others. The beautiful buildings are highly detailed, and all had been scratchbuilt using nothing but plant materials - tiny pieces of bark, dried leaves, reeds, seeds, dried flowers, grasses, pods, berries, palm fronds, moss and other natural items - designed into architectural caricatures by the show creator, Paul Busse and his crew. Now that’s scratchbuilding! The locomotives and railcars represent American prototypes from 1800 to the present. There are several trolleys and freight trains and a very impressive Pennsylvania Railroad passenger train on an elevated oval track. They are powered with low voltage on gauge-1 brass track. The bridges are awesome in size and design as are the prototypes and are also scratchbuilt with great attention to detail. Many of the tunnels are made from hollowed logs. If you are anywhere near New York City during the Holidays, this show would definitely be worth a look. It only lasts until January 9, 2011 however. You can buy the tickets online. NYC Botanical Gardens from Greg Warth on Vimeo. From "Garden Railroad" to "Showcase"
From "Garden Railroad" to "HomePage"